As members of the Central American migrant caravan continue to flock to the U.S. border in search of a safe haven, Trump Administration officials do all in their power to stem the flow of migrants and deter them from lodging asylum requests. To that end, a new draconic policy has been launched in early May, according to which children of migrants would be separated from their parents upon crossing the border, and will be kept away from them as the latter are prosecuted in federal courts for crossing the border illegally. According to the New York Times, an estimated 700 children (including 100 under the age of 4) were forcibly separated from their parents between October 2017 and April 2018. Under the new policy, drafted by Attorney General Jeff Sessions, such numbers are predicted to rise dramatically. Defending the policy, Sessions claimed, “We don’t want to separate families, but we don’t want families to come to the border illegally…This is just the way the world works…If you are smuggling a child, then we will prosecute you and that child will be separated from you as required by law.” Sessions’ reliance on existing regulations are highly misleading, however. 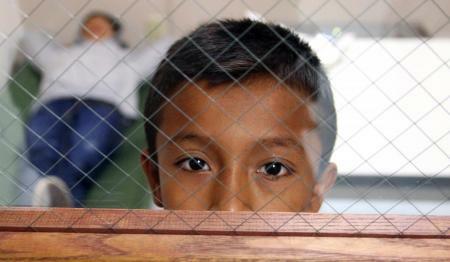 While U.S. law does view children of migrant parents who are criminally prosecuted as unaccompanied minors, and thereby places them under the care of the Health and Human Services Department, it is the recent policy of automatically prosecuting migrants in criminal federal courts that enabled the drastic spike in family separations. Sessions’ directives are backed up by high ranking officials at U.S. Immigration and Customs Enforcement (ICE), who blame the migrants for placing their children at risk by illegally crossing the border, and urge them to submit asylum claims at ports of entry only. “This isn’t just about law enforcement, it’s about saving lives” said a top ICE official, insinuating that it is also the welfare of asylum seekers the authorities are concerned about. Yet, in reality, even those who present themselves at ports of entry and submit official asylum requests are now subject to prolonged detention that could lead to separation from family members; this is also the result of the Trump Administration rescinding regulations instituted during the Obama era to release asylum seekers while their cases are being processed. In the meantime, little is known of the whereabouts of the migrant children ripped apart from their parents. While White House Chief of Staff, John Kelly, gave a vague assurance of their wellbeing, claiming that „the children will be taken care of – put into foster care or whatever“, it becomes clear that no real policy exists to guarantee the childrens’ safety. During an April Senate Committee testimony, the acting assistant secretary for the Administration for Children and Families admitted that as many as 1,475 children who were placed in foster homes by the Office of Refugee Resettlement are presently unaccounted for. It is crucial to understand that the policies enforced by the current administration (criminally prosecuting asylum seekers and separating them from their children) do not only traumatise an already vulnerable population and bluntly violate their basic human rights, but also exacerbate the erosion of America’s asylum mechanism, and negate the country’s commitment under the Refugee Convention. Nowhere in the convention is there a stipulation restricting refugees to enter a country in which they intend to apply for asylum through officially recognised border crossings. The convention does stress, however, the refugees’ right to maintain their family unity while fleeing persecution in their home countries. It is now up to the American public to pressure their elected officials to abandon their practice of stigmatising and criminalising asylum seekers, and adhere to America’s commitments as a member of the international community and a signatory to the Refugee Convention.